SHAH ALAM, 16 November 2018 – Three students were being selected to represent Universiti Teknologi Malaysia (UTM) as the participants of the 8th International Conference on Gross National Happiness (GNS). UTM team led by Dr. Akbariah Mohd Mahdzir were represented by Anis Fahizha Fahim from Malaysia-Japan International Institute of Technology (MJIIT) with Mac Foster Sulai Anak Langkau and Lee Ern Tung(Razak Faculty of Technology and Informatics). Dr. Akbariah said that the idea of forming a network of Young Happiness Ambassadors was to share the young peoples’ perspectives, experiences, actions and solutions in the GNH discourse. “Besides contributing to the GNH discourse, the young happiness ambassadors would advocate or promote GNH in schools, universities, colleges and youth organisations in order to mobilise a youth movement that champions the four pillars of GNH. “The formation of the YHA’s network and the establishment of YHA Charter are some of the outstanding outcomes of the GNH conference,” said Dr. Akbariah. The three UTM participants have joined the nineteen Young Happiness Ambassadors from Malaysia together with another 150 delegates from 12 countries at the international conference held from 14th to 16th November hosted by Universiti Teknologi MARA (UiTM) in Shah Alam. This conference was held based on the collaboration between the Universiti Teknologi MARA, Malaysia and the Centre for Bhutan Studies & GNH (CBS & GNH). The Centre for Bhutan Studies and GNH Research (formerly The Centre for Bhutan Studies) is a research institute located in Thimphu, Bhutan established in 1999 with the purpose of promoting research and scholarship in Bhutan. This conference aim was to provide a creative platform for inspirational exchanges, interaction and scientific debate on research related to Gross National Happiness in areas not limited to Public policy development, Economic system, Education, Spirituality, Life Styles & Health, Cultural Communication, Tradition & Heritage, Ecosystem Resilience Measurement and Index. The three days conference was officially opened by Pro-Chancellor of UiTM, YBhg Tan Sri Datuk Panglima Dr Abdul Rahman Arshad. Also attending the ceremony was President of the Centre for Bhutan Studies & Gross National Happiness, Mr. Dasho Karma Ura. 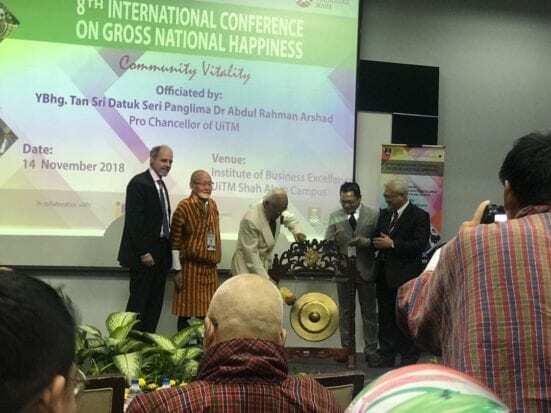 Pro-Canselor UiTM, YBhg Tan Sri Datuk Panglima Dr Abdul Rahman Arshad (third left) during the launching ceremony of the 8th International Conference on Gross National Happiness (GNS) at UiTM Shah Alam.